FLIR announced it has received a significant delivery order for FLIR identiFINDER® R300 spectroscopic personal radiation detectors (SPRDs). The delivery order is under a five-year indefinite delivery, indefinite quantity (IDIQ) contract from the U.S. Department of Homeland Security (DHS), Domestic Nuclear Detection Office (DNDO) for the Human Portable Tripwire (HPT) program. The order is valued at $17.174 million, with deliveries extending through the second quarter of 2019. The identiFINDER R300 is a belt-worn spectroscopic pager that virtually eliminates false alarms and false positives by providing continuous radiation detection capability and full threat identification. Under the contract, all DHS components will be able to procure HPT systems and associated services, including warranty, extended warranty, maintenance support, training, and documentation, as needed. When radiation detection capabilities are necessary, first responders and security personnel must rely on the accuracy and dependability of their instruments. With the highest detector resolution available in a pager-sized device, the R300 virtually eliminates the false alarms and false positives that are so common to personal radiation detectors. With both detection and identification capabilities available in a single, rugged device, those on the front lines of homeland security can trust the R300 to make their job easier. About the same size as a cellphone, the belt wearable R300 provides continuous detection capability with visible, audible and tactile alerts. Once radiation has been detected, the fast identification capability of the instrument provides essential information to the user in the field, enabling them to make a next step determination. The One Touch Reachback™ feature integrated into the R300 allows the user to immediately send a notification to team members, superior officers, situation management personnel, and expert analysts – all with a single push of a button. The R300 uses uniquely constructed Cadmium Zinc Telluride (CZT) detectors that enable exceptional sensitivity and identification capabilities never before seen in a spectroscopic personal radiation detector (SPRD). The characteristic design of FLIR CZT detectors is more rugged than scintillation-based detectors and does not require temperature stabilization. The R300 is also available with an optional neutron detector as well as a full range of accessories. To reduce the training burden on first responders and security personnel, the R300 uses the same easy to understand and navigate user interface common to the entire family of FLIR radiation detectors. With two-button controls, operators can pick up a R300 and begin using it simply and quickly. 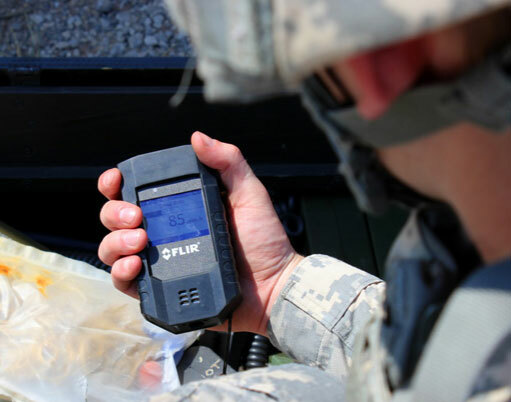 With the R300, FLIR continues to provide the most technologically advanced radio isotope identification devices in the industry.